Rumah Sakit Umum Pusat Dokter Kariadi Semarang - RSUP Dr Kariadi Semarang or known as as "RSUP Dr Kariadi" is a major Government-owned hospital in Semarang Central Java. 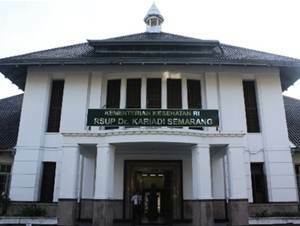 RSUP Dr Kariadi is the Class A Hospital and has a functions as a referral hospital for the region of Central Java. RSUP Dr Kariadi operates directly under the Government of Indonesia through the Directorate General of Health Effort Care of the Ministry of Health Republic of Indonesia. RSUP Dr Kariadi also affiliated with the Faculty of Medicine Diponegoro University (FK UNDIP). RSUP Dr Kariadi has legal domicile in Jl Dr Sutomo No 16 Semarang. According to information found in the Hospital's website as cited by JobsCDC.com, RSUP Dr Kariadi was first established in 1925 as a Dutch Hospital under the name Centrale Buzgerlijke Ziekewsichting (CBZ). The name of RSUP Dr Kariadi was officially launched in 1964. RSUP Dr Kariadi now has 967 installed beds capacity, including 2 president suites, 13 VVIP, 103 VIP, 9 main beds, 106 Class I, 139 Class II, 519 Class III, 32 isolation, and 44 intensive. As of January 2014, RSUP Dr Kariadi employs more than 3,639 direct employees, comprise of 1,675 PNS and 986 Non PNS. Minimum age of 20 years and maximum age of 35 years old. D3 Nursing with minimum accreditation B (PTN/PTS) and Cumulative Grade Point Average (GPA) ≥ 3.00. Minimum height of 155 cm for Female and 160 cm for Male with ideal of weight/proportional and attractive appearance. Pass the written test (TKD and TKB). Pass the psycho test, psychiatry and interview. Well behaved with a letter from the police. Laboratory tests consist of: hepatitis B screening results (HBs-Ag, Anti HBs and Anti HBc), complete blood and urine routine. Results of reading thoracic photos. Special for married female participants attach a pregnancy test . At the time of registering not being pregnant. Willing not to get pregnant during the first year contract period. JobsCDC.com now available on android device. Download now on Google Play here. Please be aware of recruitment fraud. The entire stage of this selection process is free of charge. RSUP Dr Kariadi Semarang - D3 Nurse Non CPNS RS Kariadi May 2018 will never ask for fees or upfront payments for any purposes during the recruitment process such as transportation and accommodation.